Every time you meet someone it’s an opportunity to tell them about yourself and eventually hand over a business card. I just attended Lucky FABB and collected several of them. When you make the exchange (hopefully the other person has one too), what happens next? Do you have a Rolodex full of cards never used? Does it get buried under a bunch of other cards? Do you take one look at it and throw it away? Does it show up in a pocket of an item you wear a year later? I hope the answers to these questions are no. So what should you do? 1. Once you get a business card take a quick look at it while you’re in the presence of the other person, acknowledging that there is at least some interest and then put it away. 2. IMPORTANT!! Within 24 – 48 hours (or as soon as possible if it’s not feasible within that timeframe) send an email to the person saying it was nice to meet you and let’s keep in touch. You have no idea how far that goes and it’s so important! 3. Check out their website and what they do. They may or may not be of use to you, but possibly you can refer them to someone who might. 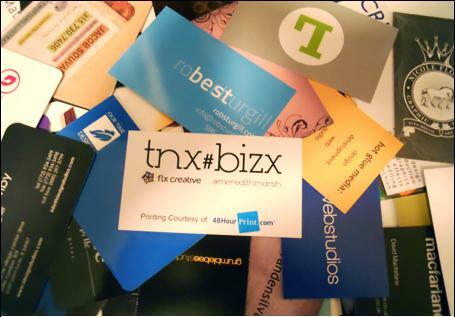 If you’re not into carrying business cards you can go digital and follow them on Twitter, befriend them on Facebook, or Like their fanpage. Another new concept on the scene is contxts.com. It’s a mobile SMS business card, where you can send your info directly to the recipient via cell or they can text a pre-selected word to a contxt number and get your info. It’s quick, easy, paperless and free to join. It also serves as a backup when you run out of business cards! For example text DANIEL to 50500. What do you get back? So, when you get your next business card, PLEASE make sure you followup. It’s a small step to possibly greater things! William B + Friends Styling Contest – Vote for Me! Hello Everyone! I know it’s been a hot minute, but I hope you are well! 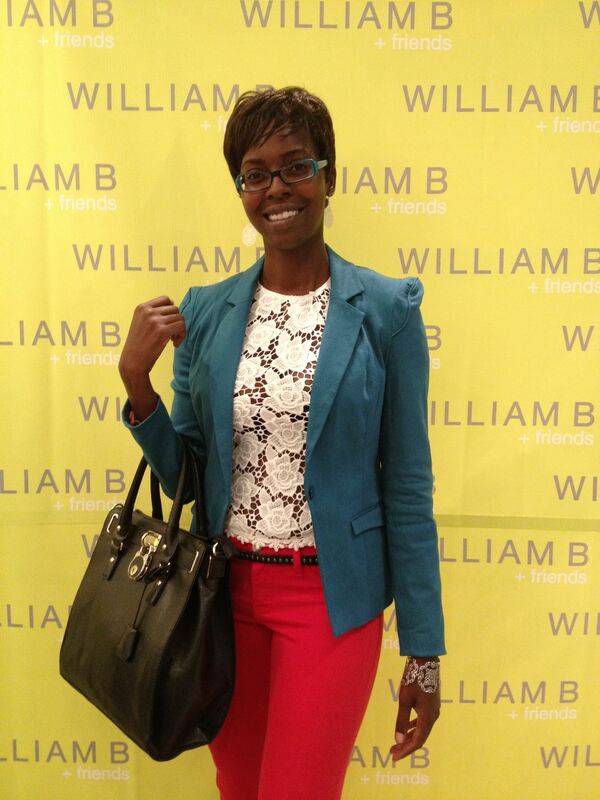 I attended the grand opening of William B + Friends at Westfield Century City and I entered a styling contest at their store where I had to create a head to toe look. I scoured the entire store which has a lot of fun, chic, affordable clothing for women and I created this colorful ensemble which was exciting to put together! William B + Friends fall look I created. Please like this exact photo on their Facebook fan page! If my photo gets the most likes on Facebook I will win an iPad. Please go to their FB page and like the photo as I would love to win this as an early Xmas gift! What I also like about this look is that it can be worn for your 9 to 5 and then for a night out take off the blazer and you have a fab lace top you can rock the night away in! 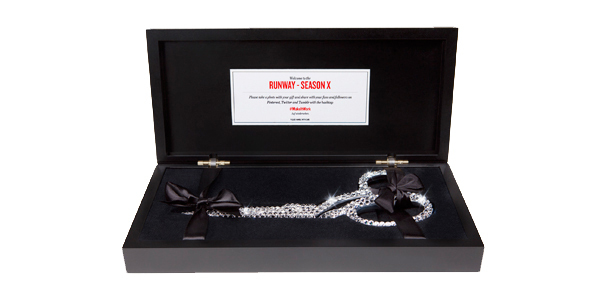 The contest ran for 8 weeks and each week a winner was selected. Well, I am happy to say that I was chosen as the winner for the first week! I was notified recently that I was selected and just received my prize in the mail which is a pair of glammed out scissors! I was so excited to hear that I won and Project Runway is one of my favorite shows to watch. So what’s next from me? Perhaps I’ll be a buyer or start designing my own clothes! 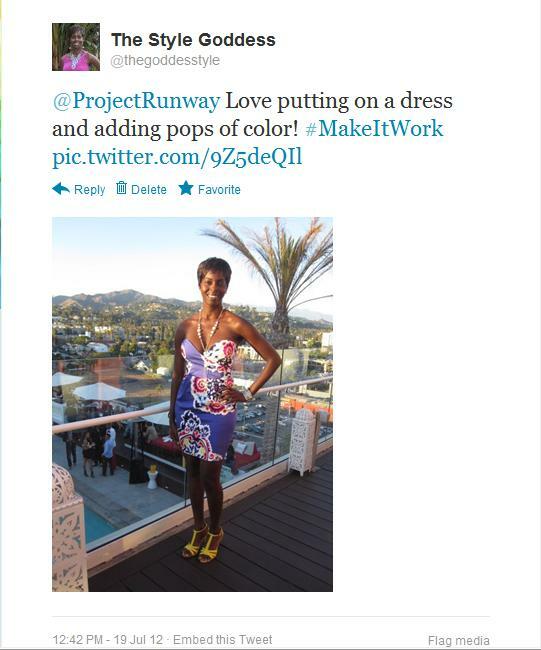 Thanks Project Runway and Lifetime for choosing me as a winner! Happy Wednesday! As I continue to share event tips every week, I notice that everything can be an event: building a house, planning a trip, buying a car. Here are some more tips to keep you on your feet, from M-O! Get the word out about your event through all key avenues! 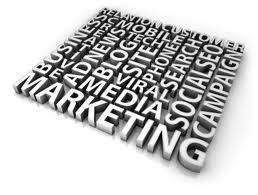 Marketing: When marketing your event, there are several different mediums to use: Email, Twitter, Facebook, News stations, bloggers, direct mail, public signage etc. You don’t have to use them all, but you want to use key ones that you feel are most effective and will get the word out. A crucial thing to do is if there are several vendors involved to make your event happen, you should alert them immediately so they have time to respond for participation and availability. You also want product placement visible throughout your event. Attendees should be able to immediately know what the event is about when they enter the venue. For social media savvy events, have signage scattered throughout the event with key Twitter handles and hashtags for live tweeting. How do your registration numbers compare between your events? Numbers: At the end of the day, every event is all about numbers. Data is needed to determine how to adjust for your next event. 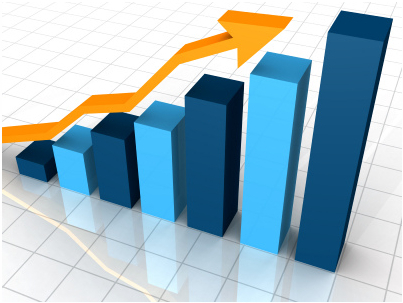 Attendee count, sales, surveys and vendor pricing are common metrics one should have post event. You also always want to keep track and see if you are under or over budget. Make sure that you also designate someone to do a head count at your event it if isn’t available electronically. Always keep your office space when planning an event. Makes life easier! Organize: If there is one thing you must have during event planning its organization. Paperwork, vendor contacts, supplies, etc. should all have a home where you can easily access everything without having to search. Creating a cheat sheet with all contacts for your event is helpful and designating a room or drawers for supplies will keep things in order. Have a run of show compiled to hand out to everyone with pertinent contact info. Being organized leaves you not wasting time and being able to handle multiple things! Time For Lip Service & Enter to Win! Lips. They’re a part of our body that may be neglected when it comes to moisturizing. But now, it’s time to listen up and pay more attention to that pucker! In stores everywhere in October, I got a sneak peek at the newest product from Blistex called Revive and Restore. Two separate jars full of fruity goodness that can be nested together with a twist, Revive is perfect for the day leaving your lips invigorated and refreshed with key ingredients like shea butter and SPF15. Restore, loaded with Vitamin E can be used in the evening to rejuvenate your lips and soften any dullness from the day. I’ve used it at night and it’s nice to wake up with lips ready for a kiss! Another great thing is that you can carry these jars as a set or keep one in your purse and the other at home for the second shift. Either way this product has makes you want to apply it all the time! Pramoxine HCL – advanced analgesic that alleviates sensitivity to lip soreness, pain and itchiness, without a medicated flavor and scent. Dimethicone – delivers a highly effective barrier that prevents moisture loss and protects lips. Glycerin, lanolin and sunflower seed oil – help re-moisturize lips parched from the effects of illness or dry air. Vitamins C & E, chamomile, green tea, honey and elderberry – provide comfort to irritated lips. Just in time for the fall season, the Cold and Allergy Lip Soother will also be available in October. Now that I’ve given some lip service, head to your nearest drugstore next month for these fall lip essentials and also check out Blistex for their entire product line and lip tips! Start fall in style with lip essentials! Enter now for a chance to win the Blistex Fall Kit which includes Revive and Restore, Cold and Allergy Lip Soother, Silk & Shine, Deep Renewal and Lip Ointment! The contest ends on Friday, September 30 at 11:59PM PST and the winner will be notified shortly thereafter. Good luck! 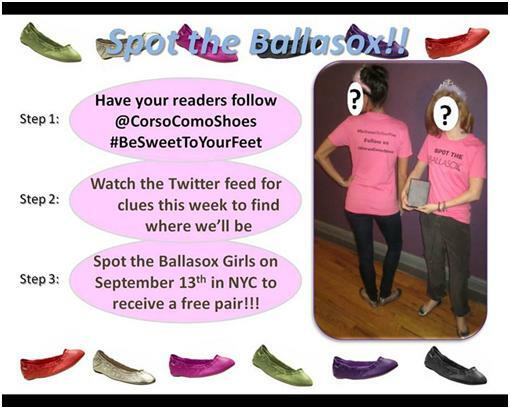 In the next 24 hours, follow @CorsoComoShoes and #BeSweetToYourFeet to get the clues of where the Ballasox street teams will be on September 13th during Fashion Week. If you “Spot the Ballasox” Girls on the streets of NYC, you will get a redeemable code for a free pair of Ballasox flats in any color you want from the website. Mention to the Ballasox Girls my name (Stacy Gardner), and that I sent you from Examiner.com and you will be guaranteed this special treat for your feet. So get ready and keep your eyes on Twitter for deets!